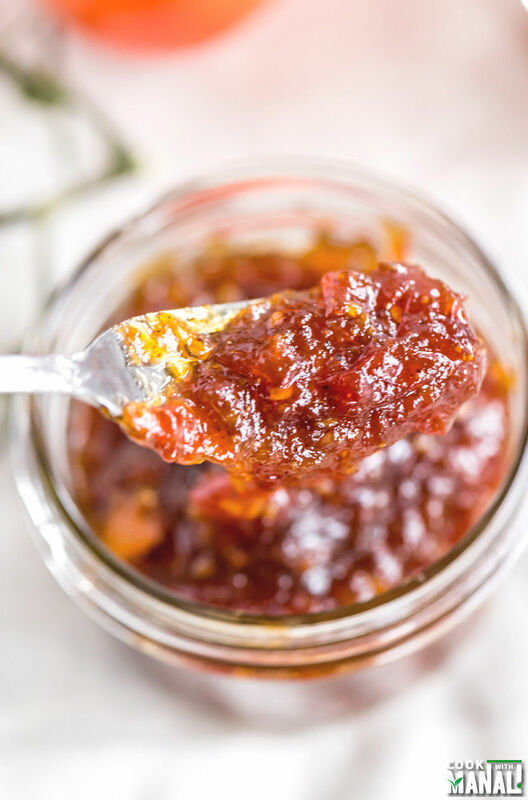 Sweet & spicy tomato chutney is the perfect accompaniment to Indian meals. You will love it with paratha or your sandwiches! India is often called the land of chutneys and pickles. Whatever you can think of, from lemons to onion to tomatoes to cauliflower to carrots and everything in between – we can make a chutney or pickle out of it. Indian meals are often incomplete without a side of chutney. 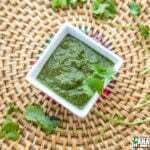 The most common chutney that you get in every Indian restaurant is the mint cilantro chutney. It goes so well with all Indian appetizers, breads etc. however there are some other amazing chutneys as well. I remember when I was little, I was so fond of a garlic and green chili chutney. It was basically just crushed garlic, chili and oil and it used to taste amazing with plain paratha (flatbread). One of our house helpers at my grandparents house used to make that chutney and whenever we went there during our summer break, that chutney was the first thing I demanded! This year while I was in India, I was totally hooked onto this sweet & spicy tomato chutney. 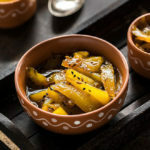 This is my mother-in-law’s recipe and I am so excited to be sharing it with you guys because the chutney is absolutely amazing! My MIL learnt this chutney way back in the 70s when she attended some cooking class. She had this written in her old diary and she made it this year while we were visiting. Once I had this tomato chutney, I wanted it everyday. Seriously guys it tastes so amazing with parathas or just about anything! I was so hooked onto to it that by the time we were leaving, I asked mummy to give me the recipe. She just explained me verbally how she made it and made me write down the ingredients. So as soon as I was back here, I had to make it! And I did and it turned out amazing! 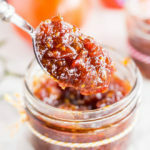 Few things about this sweet & spicy tomato chutney – there’s a lot of garam masala in it so some people might find it hot. When I tasted it as soon as it was done, I found it too spicy but as it cooled down, it became just perfect. However in case you can’t handle all the heat from garam masala and the chili powder, please reduce the quantity of both. 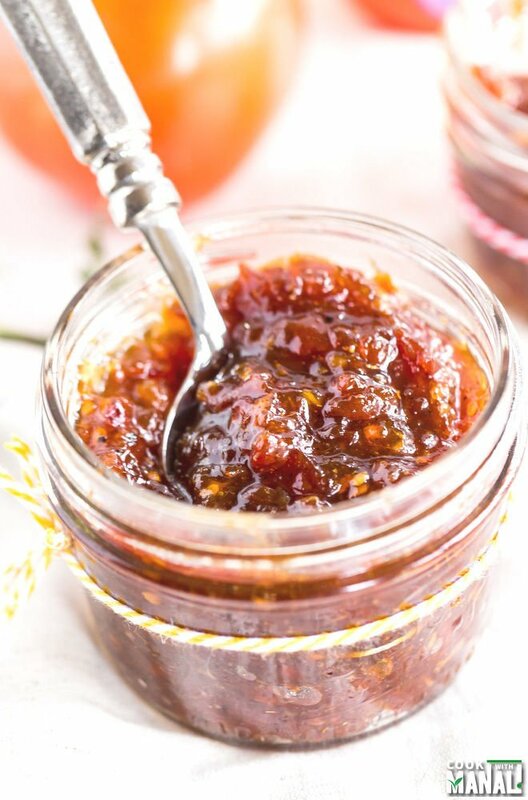 This sweet and spicy tomato chutney is great with parathans, on top of bread or with your favorite snacks! The chutney obviously is vegan. Heat 1 teaspoon of oil in pan on medium heat. Add finely chopped tomatoes. Cook for 20-25 minutes or until the moisture in tomatoes totally dries out. Set aside. Pulse ginger-garlic and onion in food processor. You want them really fine for this recipe. Heat a pan on medium heat and add 2 tablespoons of oil to it. Once the oil is hot add the chopped ginger and garlic and cook for a minute or two. Add onion next and cook till the raw smell of the onion goes away completely. Now add the prepared tomato and mix well. Cook for a minute. Add garam masala, red chili powder, vinegar and salt. Mix well and cook for another minute. The chutney will turn liquidy as the sugar melts. Keep stirring and cook for another 2-3 minutes till it thickens a bit. Don’t cook it for too long because the chutney will thicken as it cools down. Remove from heat and let it cool down. Once the chutney has cooled down, store it in an airtight container. 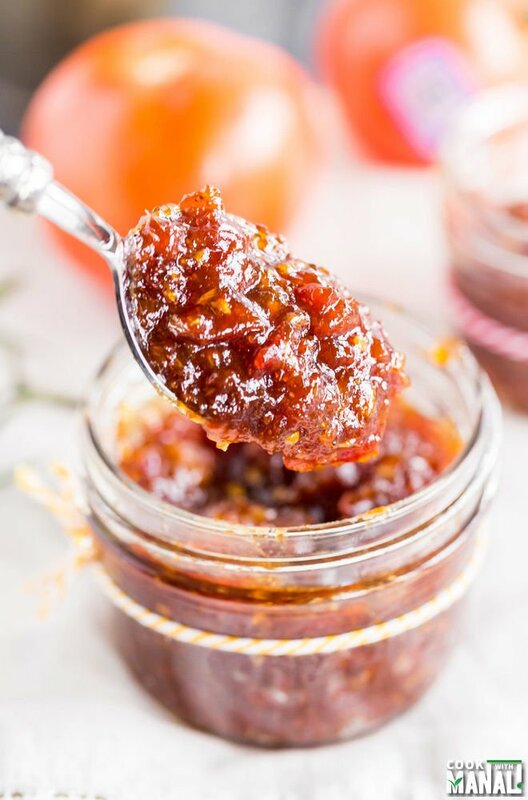 If you’ve tried this Sweet & Spicy Tomato Chutney Recipe then don’t forget to rate the recipe! You can also follow me on Facebook and Instagram to see what’s latest in my kitchen! Cook for 20-25 minutes, stirring in between or until the moisture in tomatoes totally dries out. Set aside. Heat a pan on medium heat and add 2 tablespoons of oil to it. Once the oil is hot add the chopped ginger and garlic and cook for a minute or two. Now add sugar and mix. The chutney will turn liquidy as the sugar melts. Keep stirring and cook for another 2-3 minutes till it thickens a bit. Don't cook it for too long because the chutney will thicken as it cools down. Remove from heat and let it cool down. Once the chutney has cooled down, store it in an airtight container and store in the refrigerator. Adjust the garam masala and red chili powder to taste. The chutney gets quite a lot of heat from the garam masala, if you think you can't handle it, reduce the quantity of garam masala to 1 teaspoon. This looks amazing! Sweet and spicy..a great combo of flavour. Oh this chutney looks delicious, Manali! I’ve never actually made my own before, but I definitely need to start after seeing this recipe. I love the combination of sweet and spicy! What a fun recipe, Manali…I love that it got passed down from your MIL, too. I’m used to sweet chutneys, but I’m totally intrigued by this spicy version. Looks delicious!! I’ve never had a tomato chutney before! You make it sound so tasty; it’s definitely worth a try. Family recipes are always the best, aren’t they? Have a great weekend! Love tomatoes ! This will go well with so many things! Love the flavors, going to make it soon! This sweet and spicy chutney looks amazing..In south we call it thokku a dry kind of chutney without garam masala.Yours is entirely different and so chunky ..
I’m stumped on the 250 grams of sugar. How many tablespoons or cups is that? around 1.25 cups of sugar (US cups) …its a traditional style chutney and sugar acts as a preservative too..reduce the sugar if you like. I wish I had of seen this before the weekend, as it would have been perfect for the cheese board we had at the weekend. I LOVE chutneys and this one looks delicious. I had never try this tomato chutney, but I’m thinking about adding it to a serrano ham baguette, something similar to pan tomate… very interesting! Awesome! Glad you liked it Danielle! Your cooking is great! I love it. I’m going to try this ! Did you skin and deseed the tomatoes? It’s amazingly tasty! Made double amount – two jars and a little left over. Am saving for Christmas. Took longer for liquid to boil down but apart from that, true to recipe and dead easy to make. Made this chutney! Was yummm!!! much 2 sweet! 100g of sugar should do. besides that very tasty! I just made this and it smells out of this world…but I agree on the sugar. Next time I will add probably 2/3 or 1/2 the amount in the recipe. Other than that…yum!! 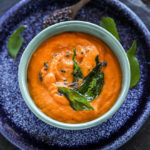 This looks delicious, and I have been looking for a tomato chutney recipe, and I am assuming that the Nutrition Facts would be correct for the entire recipe yield of two cups. its just an estimate Catherine..calculated by this plugin..I can’t say how accurate it is but yes an estimate… hope you like it! I would really like to try making this chutney, but, I’m not sure how much ginger you are calling for…….is it calling for a piece of ginger that is 3 inches long? Thanks for your help. it’s 3 inches ginger..now that can be a single piece that is 3 inches long or 3×1 inch ginger pieces..it doesn’t matter.. you need 25 grams for ginger for this recipe! Thanks! I just need to buy the gram marsala and then I’m going to make this! I made this on Sunday and it worked perfectly! I ended up making 7x the recipe so it took much longer to thicken, but the end result is great and made 14 jam jars worth. The only thing I’d say is maybe don’t add all the sugar at once, as we found it a bit too sweet so had to add in more spices to balance it out! Better to do most of the sugar and then top it up if you think it needs it! I couldn’t resist this recipe, I had 2kg of cherry tomatoes so I quadrupled the recipe and use the food processor to slice them up, my gara masala was not hot and I used only 1 fresh jalapeno, no chili powder, it is yummy and not too hot although I suspect most of the heat comes from the huge amount of ginger. When I bought the ginger I forgot I was quadrupling the recipe so I only bought about half of what I needed and then topped it up with an additional tablespoon of ginger powder. I love spice but I don’t love heat so as it turned out this was perfect for me. 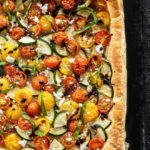 Love this recipe, thank you for sharing. Glad you liked it Shannon!